Apart from normal text and images, you can showcase videos through Pinwheel Slider WordPress plugin as well. Here is a simple video content Pinwheel Slider showing teasers of some upcoming Hollywood movies. Note – You can mix images and videos in the slider as well. For example, you can showcase 4 images and 3 videos in a 7 slides slider with an order of your choice. 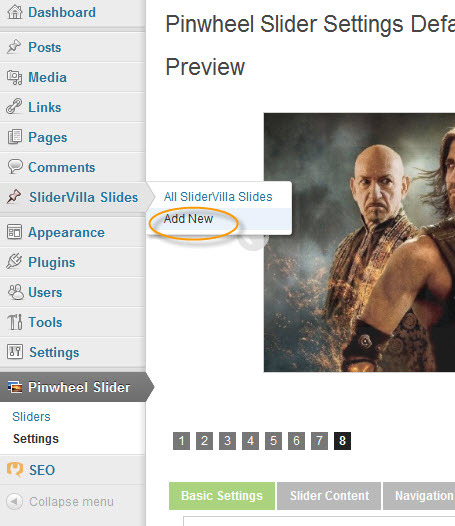 Now below ‘Comments’ Admin Menu, you will see a new Custom Post Type named ‘SliderVilla Slides’ . Click the below image for the Screenshot. 3) Add the IFRAME embed code of the YouTube video as a custom field named pinwheel_media. (Refer http://www.youtube.com/watch?v=EEu8hTQuwDI to know more about how to add custom field in WordPress post). In the embed code, you need to add some extra lines as well for proper operation. Here is an example of IFRAME embed code where you can find the extra code in bold and red. That means, you need to add these extra lines in the embed code that you get from YouTube. Step 2 – You can remove the post title and excerpt on single click from “Pinwheel Settings ==> Slider Content ==> Thumbnail Image ==> Make pure Image Slider”. Check this option to remove the text appearing on the bottom area of the slider. Or you can also choose to have the text below the video by selecting “No” for “Overlay Text on Center” on the same settings page. Step 3 – In above demo, I have disabled the “Auto Sliding” of the slider. You can disable that by selecting “No” on “Pinwheel Settings ==> Basic Settings ==>Enable autosliding / autoscrolling” option. (Optional) Step 4 – I have also removed the navigation numbers and place the navigation arrows a bit below. You can remove the navigation number from “Pinwheel Settings ==> Navigation Settings ==> Navigation Numbers ==> Show Navigation Numbers”, Select “No” to do that. To move the Navigation Arrow a bit down, you need to change the value of “Pinwheel Settings ==> Navigation Settings ==>Navigation Arrows ==> Previous Navigation Button Distance from (Top 80%) and Next Navigation Button Distance from (Top 80%). If you want to have Pinwheel Slider on your WordPress site, you can purchase the same at very low price of just $9. Once you will click on the Download Now button provided below, you will be taken to the PayPal Payment Gateway. Complete the payment process and you will instantly receive a download link through a receipt email, with your unique order number. Downloaded zipped folder is having all the required files and implementation instruction. In the next few hours of purchase, you will receive login details for the SliderVilla Premium Support Forums. P.S. If you want any specific customization for Pinwheel Slider or any other plugin purchased from us, we can provide a separate price quote for that as well. If you have any query or concern, feel free to contact us.